Movie audiences have long held a fascination for dinosaurs, which have been depicted in various filmic forms since the early 1900’s, with 1994’s Jurassic Park, directed by Steven Spielberg, arguably serving as the gold standard for the genre. In fact, the first Jurassic Park was such an iconic and wonderful film, that it seems to lead people to forget that there are several other great dinosaur movies that have captured the imagination of audiences throughout the years. Therefore, in honor of this weeks release of Jurassic Park: Fallen Kingdom, I would like to present a list of top ten films which feature dinosaurs that do not contain the word Jurassic Park in the title. This is a really cool silent short directed by and starring special effects pioneer, Willis O’Brien. In fact, The Ghost of Slumber Mountain was the first movie to blend live action photography along with stop-motion creatures. It is about a man who acquires a special telescope and witnesses a fight in the distant past between a Triceratops and a T-Rex. Much of the film is considered to be lost today, thanks to producer, Herbert Dawley’s insistence that the film be cut down to 20 minutes. However, the film that was released still resonates. Based on Arthur Conan Doyle’s book of the same name, The Lost World was produced by one of the first major film studios, First National Pictures. It is arguably the first popular major Hollywood film to feature dinosaurs. This film was noted for its realistic special effects at the time, which were created under the supervision of Willis O’Brien. Don’t worry, we haven’t heard the last of him yet. Yes, this is a movie about a giant ape, however, in the 1933 and 2005 versions of the film, King Kong fights and defeats a dinosaur(s). Directed by the criminally underrated Merian C. Cooper with special effects by, you guessed it, Willis O’Brien. It depicts the classic tale of Beauty and the Beast with a twist involving giant monsters no less. Great performances all around, most notably, Fay Wray. It is not a film to be missed, especially if you are a fan of movies. Peter Jackson made a remake of this movie back in 2005 that was also good, and featured several awesome dinosaur fights as well, however it didn’t make the cut in this list because it was too long. Even if you haven’t seen this movie, you might have seen a poster of Raquel Welch taken from this in several films, most notably in Shawshank Redemption, which Andy puts up in his cell. 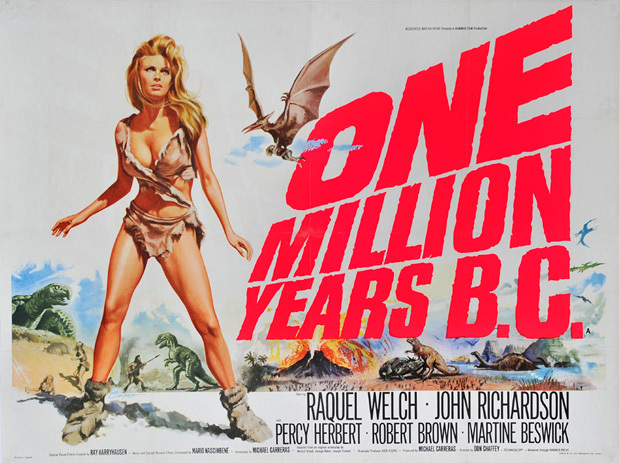 One Million Years B.C. is an action adventure that depicts early humans trying to survive in a harsh world, where they must defend themselves against dinosaurs. It features stop motion animation by Willis O’Brien’s protege, the legendary Ray Harryhausen, and it’s tons of fun to watch. 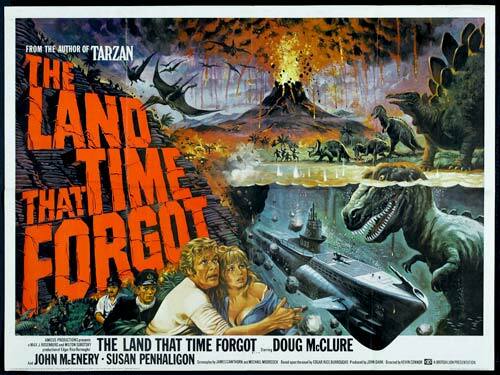 This is quite possibly my favorite dinosaur movie after the first Jurassic Park. It is basically a mashup of King Kong and The Lost World, with a little bit of western fantasy embedded within. It is about a group of cowboys and paleontologists on the trail of an extinct miniature horse, who stumble upon a lost prehistoric valley, where they find an Allosaurus named Gwangi, whom they capture and put on display at a Wild West Show. It was originally a passion project of Willis O’Brien’s, who died several years prior to the start of production. It was animated by Ray Harryhausen instead. Based on the book of the same name by Edgar Rice Burroughs. it stars underrated character actor, Doug McClure, who plays the leader a group of people, and leads them to an uncharted sub continent in the South Atlantic called Caprona, where they encounter dinosaurs coexisting with a primitive form of man. The puppets used to depict the dinosaurs are kind of cheesy, but that makes me like the movie all the more. Quite possibly the trippiest film on this list. It stars ex Beatle, Ringo Starr as — what else? — A Caveman living in “one zillionth” BC, who gets kicked out of his tribe and goes on a series of adventures with his best friend, where they discover how to walk upright, make fire, use recreational drugs, and much more. 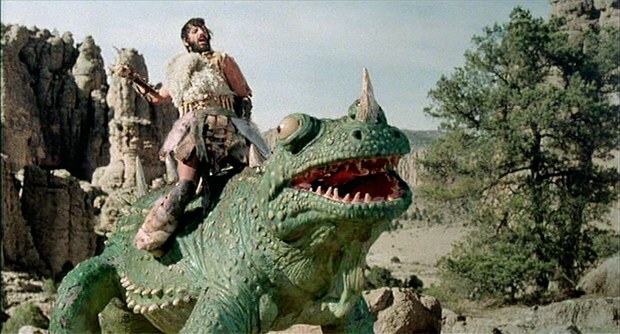 It also features him riding a cross eyed lizard, as well as him taking a psychotropic drug which leads him to hallucinate a T-Rex Buddy. It’s like Bambi with dinosaurs, only made by Don Bluth instead of Disney. Arguably my very first dinosaur film! I remember it well, since I saw it for the first time with my great grandmother in the hospital just before she died. It is about a group of adolescent dinosaurs trying to make their way home after being separated from their family. It went on to spawn an animated television show and 13 direct to video sequels. You might be surprised to find that some of them are actually pretty good! You might be a little bewildered by this entry, considering that the Transformers movies are about robots, not dinosaurs. To which I will reply, yes, but haven’t you heard that Dinobots are a thing in the world of Transformers? At any rate, I suggest you look at the picture included for this entry. It’s basically a dinosaur/fire-breathing dragon hybrid. What kind of list would this be without it? I debated as to whether or not to include this on the list for two reasons. First, it’s a King Kong title and I already included one on the list. Second, I’m not sure whether or not it the lizards featured can actually be called dinosaurs. However, the fact that they were located on a previously unknown island, coupled with their look won the debate in the end. It made me very happy to hear that it was popular, because it was one of the best action films I have seen in years. It is a reboot of the King Kong franchise and serves as the second film of Legendary’s MonsterVerse. It also has a pretty great ensemble cast that includes Tom Hiddleston, Samuel L. Jackson, John Goodman, Brie Larson, and John C. Reilly. So there you are. My list of top ten movies not named Jurassic Park! Are there any entries that surprised you? Did I omit any of your favorites? If so, please let me know below!